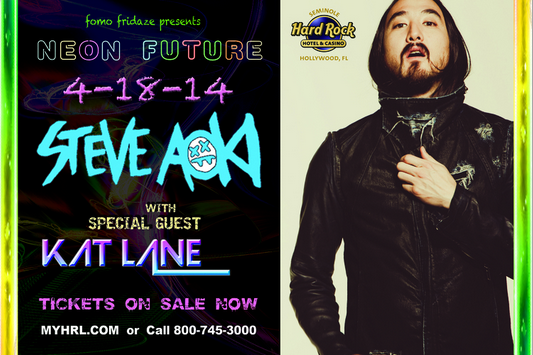 April 18th, 2014: Celebrity Standard Consulting, an SCS Partners company, brought world renown DJ - Steve Aoki - to town for an all-out extravaganza at the Seminole Hard Rock Live in Hollywood, FL. Originally scheduled as a poolside event, the event sold out 2 weeks in advance and was moved into the arena due to fan demand. The event was promoted online, on radio (WHYI, WPOW), on all televisions at the Seminole Hard Rock casino, 10 billboards in high-traffic areas of I-95, and via Steve Aoki and Kat Lane's social media (Twitter, Facebook). In the end, 2,000 fans joined Steve and Kat in raging the night away!! !